The Mankazana area is rich in wildlife and offers non-hunting observers a wide range of activities. Short, half day activities include guided game walks, horse trails, nature trails through indigenous forests and hikes to scenic viewpoints and waterfalls. Longer day trips include guided game drives to a variety of local game reserves, including the mountainous Mpofu Reserve, the rugged Double Drift Game Reserve and the world renowned Addo National Elephant Park. 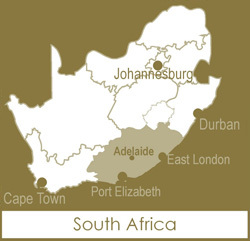 Day tips to the nearby historical and educational town of Grahamstown, can also be undertaken. Guests are welcome to visit various cultural and scientific museums, the beautiful campus and gardens of Rhodes University, or simply enjoy a day shopping for curios or take in the atmosphere of a student town, over a capuccino at a side walk café. Apart from our normal evening meals or drinks around the fireplace, evening entertainment includes guided game drives searching for our more secretive nocturnal species, a taste of local tribal dancing around a roaring campfire, or a more relaxed evening spent at the local Midgeley’s Hotel. Deep sea fishing charters and river cruises are available for those who might have tired of hunting and game viewing. We operate these activities from the nearby coastal village of Kenton-on-Sea, which is situated on the beautiful Sunshine Coast of the Eastern Cape. Renowned for it’s world famous seafood and golden beaches, Kenton offers guests a perfect opportunity to relax for a few days, prior to undertaking the long flight home.